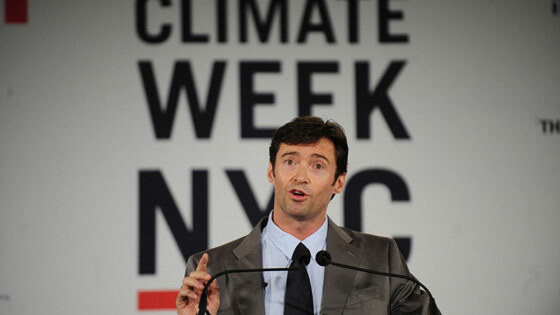 In celebration of Climate Week, kicking off in New York today, Vulture hero Hugh Jackman took time away from his grueling rehearsal schedule for Broadway’s A Steady Rain to speak at a U.N. press conference on green living: “To be fair, as an actor, this is not something I’m very accustomed to, and probably about twelve months ago this kind of event would have maybe overwhelmed me a bit,” he told reporters. “But something happened to me just under twelve months ago that put things into perspective — and that was being named the Sexiest Man Alive.” We spoke with him after his speech about both Neil Patrick Harris’s opening number last night and his Steady Rain co-star, Daniel Craig. How did you get involved with [the poverty-fighting charity] World Vision and the Climate Group? World Vision, I met with Tim [Costello] two years ago. I started as ambassador for World Vision. I actually started doing the 40 Hour Famine. Is that something that’s done here as well? [Costello interjects: “30 Hour Famine here.”] Oh, 30 Hour Famine. ‘Cause we’re tough. [Laughs] We’re tough, we do 40 hours. But, uh, I’ve actually been a sponsor for, I don’t know, 30 years, in some way. But being involved officially with Tim has been amazing, and we’ve been on two trips, Cambodia and this July we went to Ethiopia. And that was really what solidified for me the importance of campaigning not just on issues of poverty but also on climate change, because they are inextricably linked. There’s a program for Climate Week here in New York. Will you be doing more appearances? Well, I’m here today. I would love to make more; it’s not great timing for me, because our show [Broadway’s A Steady Rain] opens in a week, so we rehearse all day and do a show [at night]. So today’s my day off. Today was my day to do things. You managed to make some appearances for Fashion’s Night Out. So what can we do to fight global warming? I think start at home. It’s an issue of consumption, of course. Simple things. Also, drinking Fair Trade coffee. For me, I suppose, using my voice. I make a living pretending to be someone else, so I’m not going to lie to you that I’m an expert on this, or on the politics of it, or how to get these things done. But I did make a promise to Dukali, this farmer [in Ethiopia], that when Climate Week happened or when the leaders were here that I would do my best to edge my way into a room to tell his story. And to try and make sure that his voice and other impoverished people from developing nations are heard, because they need to be heard. A lot of celebrities do that. Are you considering becoming a U.N. ambassador like Nicole Kidman or Jay-Z? I think just president is where I’m heading. No, uh, yeah, I mean of course. I think it’s a responsibility and a fantastic opportunity to use your voice and whatever profile you have to further really great work. That, really, people like Tim and World Vision, who work full-time, are really doing the work, but anything I can do to highlight their work and to make a contribution I try and do, yeah. Could you live without air-conditioning in New York? Yeah. I open my windows all the time. I don’t like air-conditioning very much. I’m an Aussie, you know, back door, front door open, that’s air-conditioning, you know? So you are opening your Broadway show soon. How can you work with Daniel Craig and not crack up when you look at his mustache? [Laughs] Because we had four weeks of rehearsal. I gave him enough crap about it for four weeks. Now I’m used to it. Did you watch Neil Patrick Harris host the Emmys last night? I just saw his opening. I haven’t seen it all. I got home last night and I saw his opening, which was just genius. The guy is so good. Are you going to host the Oscars this year? I don’t know. I haven’t been asked.